The KATTAIKKUTTU GURUKULAM offers children and young people from seven to eighteen years training in Kattaikkuttu acting (theatre) and music on a daily basis. The training is residential and requires students to stay at the Gurukulam. It takes about four years for a young person to acquire foundational performance skills. The Gurukulam has brought Kattaikkuttu training and onstage performances within reach of rural girls and young women. This is a historic innovation in a theatre that traditionally has been a male prerogative and in a rural society that continues to stigmatize the profession of actress therewith denying rural girls and women a (artistic) voice. 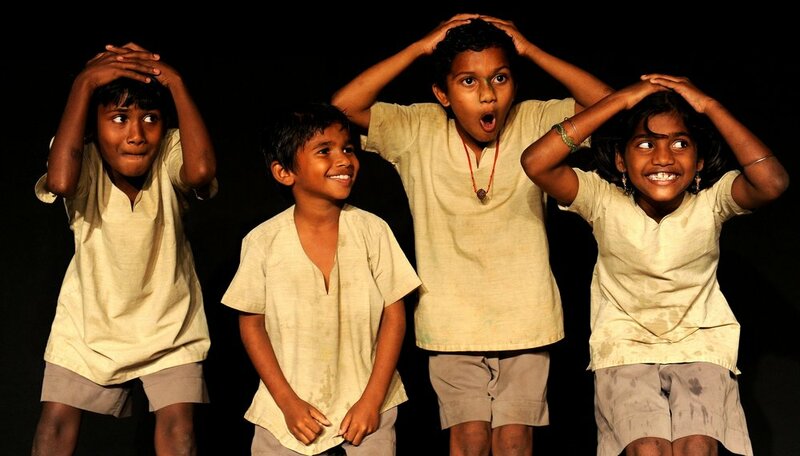 The Gurukulam’s dual curriculum recognizes the importance of theatre as education and the role that theatre’s embodied skills play in the understanding of self. It nurtures critical thinking, creativity and empathy in children and young people. The training, education and care that students receive at the Gurukulam equips them with sound artistic, intellectual and life skills. These enable them to become successful performers, or, in case they do not opt for a career in the performing arts, prepares them for higher studies or vocational training elsewhere. Since its inception in 2002 the Kattaikkuttu Gurukulam has delivered three cohorts of well-educated, highly trained and skilled young Kattaikkuttu performers, 20% of whom have found full-time employment in the field of the performing arts; 60% have gone on to higher studies whilst 20% combine higher studies with part-time performances.